My San Francisco book release party was over a year ago, but remnants of the evening remain. While looking at Flickr cheese photos, I found this portrait of a cheese left over from the reading. Abandoned on Valencia, the picture is certainly evocative. 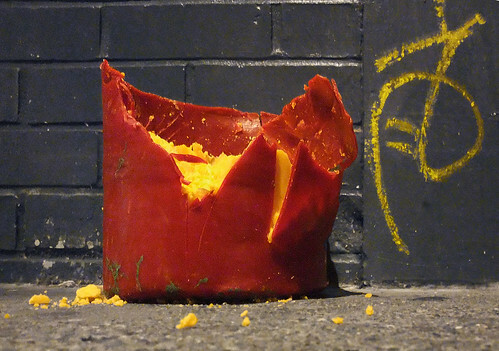 A sad, neglected cheese, used and discarded, all alone and alienated in an overcrowded city. I’m glad I could help contribute to the urban art world and the ongoing story of the struggle of cheese to come of age in the Mission. This entry was posted in Uncategorized and tagged cheese, cheesemonger -- the book, readings. Bookmark the permalink.